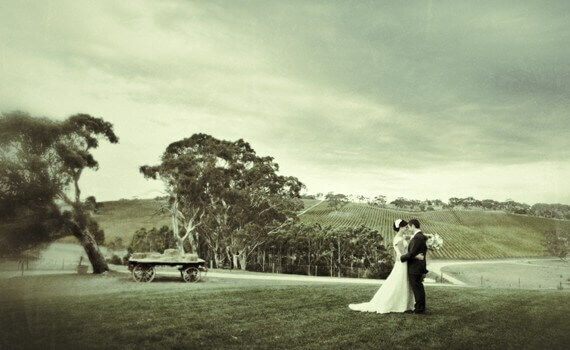 Nestled amongst the rolling hills just out of the township of Macclesfield, Longview Vineyard is a very popular Adelaide Hills wedding venue. With breathtaking views across the valley the grassed area out the front of the function room is a perfect setting for your wedding ceremony. Such stunning grounds offer ample opportunities for amazing wedding photography. The function room has been expertly renovated from the property’s original dairy and hay-shed from the 1920’s and is a great mix of old and new. With massive open fireplaces, rugged timbers, stone and galvanized iron features, it’s sweeping verandas and a wall of windows offer pristine views over the vineyard and provides an absolutely gorgeous setting for your wedding reception. Longview Vineyard is an amazing venue well worth looking at if you are thinking of an Adelaide Hills location for your wedding day.